I wasn't going to bother with Easter treats for my son's class this year (too much going on, not enough time, they get enough already yadda yadda yadda) but when I came across these Chocolate Spoons on the Sweetapolita blog, I immediately changed my mind. They were so sweet, simple and I only needed three things - chocolate, sprinkles and spoons - and I could enlist my son's help (mention chocolate and he's there in a millisecond). The perfect, tiny treat. on a spatula, book or tea-towel, to level them out while filling. Temper your chocolate in a glass bowl in the microwave (or in a heatproof bowl over a pot of simmering water on the stove), by warming for 20 second intervals and stirring in between. When the chocolate is almost (80%) completely melted, remove from the microwave and keep stirring until the last few pieces are completely melted and the chocolate is smooth. Spoon melted chocolate into your plastic spoons, about 80% full (the sprinkles will fill the rest). Add your sprinkles. Place in the freezer or refrigerator for about 20 minutes to set. 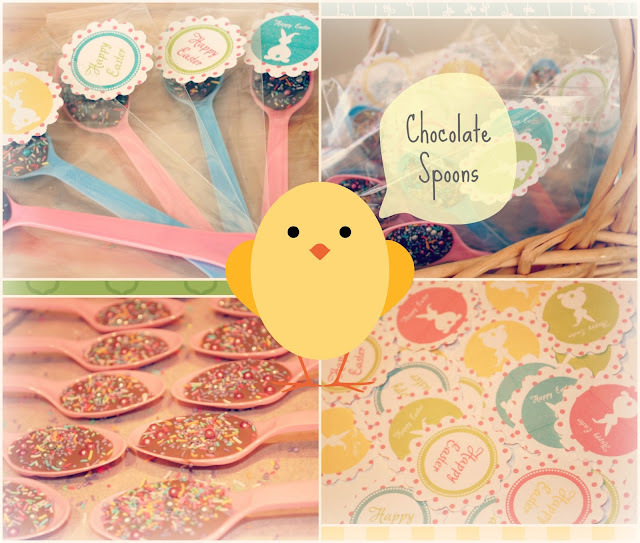 I found it easier to use a small glass jug to pour the chocolate onto the spoon rather than spooning it on, and because I needed to send these to school with my son, I popped each spoon into its own plastic bag and added a Happy Easter label, which I downloaded free from I Heart Naptime (gotta love free labels!). Sweetapolita was spot on when they said this is a very quick and rewarding little Easter treat for the kids and because there is just a mouthful of chocolate, they won't be climbing the walls afterwards. Now, there's a win-win. Try them for yourself ... go on, it's only a mouthful! !